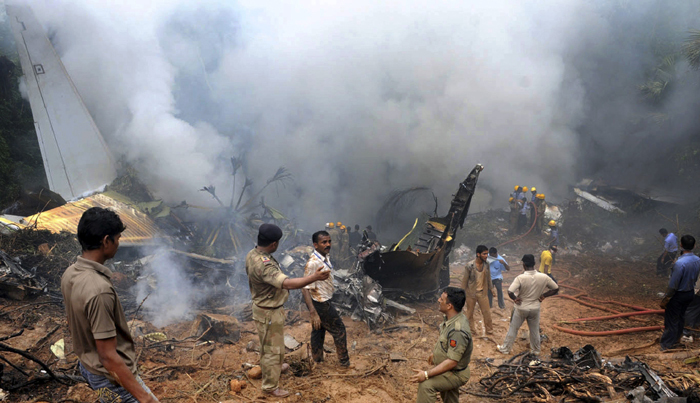 At about 6:30 a.m. (0100 GMT) on the 22nd May 2010 Air India Express flight IX812 from Dubai to Mangalore crashed, leaving 158 people dead (one died in hospital), and 8 survivors. The plane overshot the touchdown area of runway (number 06/24) and crossed the spillover area of 90 metres before it crashed into the forest.? One of the wings hit a concrete localiser instrument, a navigation aid at the end of the spillover area, and fell down. The plane spun out of control whilst smashing into a ravine, breaking up and bursting into flames. Nearby villagers were among the first to rush the accident site but billowing flames kept them away from assisting those in plane who were screaming "Banchao! Banchao!" (Save me! Save me!). Mangalore Airport police & firemen soon began rescue operations, coming across mangled bodies strewn over a large area, amongst a blackened tangle of aircraft cables, charred trees, mud and twisted metal.? Only the plane's tail was left intact. Some charred bodies still had seat belts on. As firemen doused the flames, policemen started hauling bodies from the wreckage, many burnt beyond recognition.? Each body was carried up the ravine by hand before being transferred to ambulances (some 25 ambulances and over 20 fire tenders were involved). Rescue operations were hampered for an hour by the drizzle turned into heavy rains. Civil Aviation Safety Advisory Council (CASAC)? A week after after the crash India's government formed a Civil Aviation Safety Advisory Council (CASAC), to provide recommendations to the Government on various air safety issues. Just over 30 hours after the crash, the black box was recovered by a Directorate General of Civil Aviation team, which had joined the police in searching for it. Vasant Shetty's friend had booked him on the Dubai to Mangalore flight, but he was too busy at work and decided not to fly: "It's all God's grace. I missed the flight and survived. I don't know what to say about the ill-fated passengers who were killed. I pray for them." Kunhikannan Chandu, a 51-year-old manager of a supermarket, was booked on the ill-fated flight 812 but was forced to miss it after his boss gave him extra workload: "I had booked my ticket to fly to Mangalore on Saturday morning. I was going to help my son with his admission to engineering college. However, I was told by my manager that I could not go because there was too much important work to get through. I postponed my flight to Saturday evening and then I woke up to this terrible news. God has blessed me and my family; he intervened to save my life. I feel really shaken but I told my general manager this morning that he had saved my life." Theresiamma Philip was to take the ill-fated?flight?from Dubai to Mangalore to meet her daughter but mistook the timing and missed it: "I can't believe how lucky I am to be alive. I was to take the flight, but mistook the a.m. to be p.m. and missed it. I was ruing having missed my flight when my daughter called up from Mangalore and asked me to put on the news. They were flashing the news, but even then I could not connect the two. It was only a little later when it dawned on me that it was my plane which had crashed." All the 160 passengers were Indian nationals. There were 137 adults, 19 children and 4 infants on board as passengers. Four year old Viola lost both her parents in the crash (Naveen & Sarita Fernandes), as they had left Viola behind with her aunt in the city. Manirekha Poonja, who worked in the?Gulf News's?finance department, was going on a short trip to Mangalore with her husband and 17-year-old daughter for her cousin's wedding. All 3 were killed in the crash. Sameer A Shaikh, a 24-year-old Saudi-based businessman, was going to Mangalore to attend the last rites of his grandmother, suffering a double blow as the Air-India Express Mangalore plane crash resulted in him losing 16 relatives in it: "I flew into Mumbai from Saudi Arabia yesterday and was scheduled to catch a Jet Airways flight to Mangalore this morning." he told PTI at the Mumbai airport. Sameer said his maternal uncle, his wife and 2 children, besides 12 distant relatives were among those killed . On the 2nd June a mass?funeral was held in Mangalorefor for 12 unidentified victims of?the crash, after DNA tests could not match samples provided by families. Ms ?Sabrina Nasir Haq, the lone woman survivor, is a medical student in Manipal. "The flight started fine from Dubai and there was no problem en route. The pilot announced landing and we were all prepared, with our seat-belts on. As soon as the plane touched the runway, it started vibrating and before we could realise what was happening, we heard a loud sound and the plane broke into two pieces. Then there was smoke and fire on the plane. Nobody could do anything (about the screams and shouts of people). Luckily, I saw the opening where the plane had split into two, and I jumped out of it. I could see three others who had also jumped out from the same opening. We had no hope to survive, but we survived. The plane broke into two and we jumped off the plane. As soon as the plane landed, within seconds this happened." said Pradeep G Kotian, 28, a survivor who is working in Dubai as an Indian technician. "While landing at the airport, the plane deviated and hit something. It caught fire and we fell out. We looked up and saw some opening and came out through that route. It happened all of a sudden and I considered myself really lucky to have survived this crash. I thank God for my survival" said Krishnan Koolikkunnu. "The survivor Farooq is in a stable condition. He was brought to the hospital with ten per cent burn injuries," said Dr Kadam of the AJ Hospital, where the 8 survivors were brought. "Soon after it touched the runway, I heard a sound and saw smoke quickly fill the plane... a crack appeared on the plane's body where I was seated. I immediately jumped out. Two or three people seated behind me also jumped out. I am hurt in my knees and suffered burns on my hands and face. As I fled from the aircraft, flames engulfed it." said Uner Farooq from his hospital bed, his head wrapped in bandages. "I consider myself really lucky. As soon as I jumped out of the plane, I spoke to my wife thinking she might be worried. But she was shocked to hear the news." said Mayan Kutty, 48. Seven of the 8 survivors, who were employed in West Asia, had lost their work permits in the crash because of which they could not go back to their jobs. At a press conference, Arvind Jadhav (Air India's Chairman) said the airline would be happy to absorb these survivors into its workforce. The plane was a 2-year-old Boeing 737-8HG (registration VT-AXV, delivered January 2008 ). manufacturer's serial number 36333 and line number?2481. The plane had first been flown on 20 Dec 2007. Air-India Express is the 100% owned budget arm of Air India (India's loss-making state carrier) and the only airline offering direct flights from Dubai to Mangalore. Announced?compensation of Rs.50,000 (some. USD 1,070) for the injured and Rs.200,000 (some USD 4,260) to the families of the dead, to be allocated from the?Prime Minister's National Relief Fund. Announced Rs. 200,000 (some USD 4,260) to the families of the dead. Announced an interim compensation of Rs.1,200,000 for passengers above 12 years of age, Rs.500,000 for passengers below 12 years of age and Rs.200,000 for every injured passenger, over and above the ex-gratia payment announced by Manmohan Singh. India's Civil Aviation Ministry has advised that Air-India Express will provide up to Rs.7,200,000 (some USD 160,000) to the family members of each victim as per the provisions of the Indian Carriage by Air (Amendment) Act which follows the?Montreal Convention. "Forms will be downloadable from 25th May, 2010 and also available at all Air India?Offices. Air India Charters Limited, (Air India Express), a Subsidiary of National Aviation?Company of India Limited (Air India) deeply regrets the unfortunate accident to it's B 737-800 aircraft VT-AXV, at Mangalore on 22nd May 2010 and extends heartfelt condolences to the members of the bereaved families.? The Airline will consider compensation claims, including interim compensation, arising out of the death of or injuries to passengers travelling in the aforesaid aircraft and also for the loss of baggage of? such passengers, under the provisions of the Carriage by Air Act , 1972, as amended upto date.? Hathillal ? Baug, Mangalore 575006. To provide?? immediate relief to the family members of the deceased / injured??? passengers, Air India Charters? has? decided to release an? interim? payment of? Rs. 10 lakhs per? deceased passenger of the age of 12 years or more ( and Rs.5 lakhs? for each child below 12 years of age) and Rs. 2 lakhs? for each? injured passenger,?? such sums? to be adjusted against the final compensation payable. Such interim compensation will be payable? against execution of appropriate documentation. For this? purpose,? the duly completed claim? forms may be submitted to the legal advisors of the airline at the? Tel: +91 22 22875121 / 2204 4960? Fax: +91 22 2204 0246 / 2204 4717? Mangalore International Airport is at Bajpe, some 30 km from Mangalore. The airport is in a hilly area and is considered one of the most difficult airports to land and take off. The runway is a table top airport built on what is essentially a ridge, and an overrun would result in going off a cliff of, some 75 feet or more. The runway is some 2.45km long. The airport was shut down for 8 hours after the accident, with a Kingfisher flight from Bangalore with 25 passengers on board landing at 1:50 pm after flights resumed. The Air-India Express crash was the second time a plane had overshot Mangalore Airport's runway (the first time was in 1981). Mangalore is a coastal city?around 320km west of Bangalore in Karnataka state in southern India. Further to our earlier press release concerning Air India Express flight IX-812, there were 160 passengers and six crew members on board. We have reasons to believe that there are casualties and we are awaiting details and confirmation. At this stage, our priority continues to be towards all passengers who were on our flight IX-812 and their families. Air India is extending all its support to the emergency services and other agencies that are associated with this emergency. A team has been rushed to Mangalore. Air India shall provide all assistance and cooperation to the regulatory authorities that will investigate the accident. To assist us in continuing to help those most affected by this accident, we request that relatives and close friends only contact our following telephone numbers so that communication lines are open to those who need it the most. Bangalore Helpline No. 080 66785172 / 080 22273310. Mumbai Helpline Telephone No. 022 2279 6161. Dubai Airport Tel. Nos. 00971-4-2165828/29. Further to our earlier press releases concerning Air India Express flight IX-812, these are our Helpline telephone numbers at Mangalore 0824-2451046 / 47. Air India is extending all its support to the emergency services and other agencies that are associated with this emergency. Air India has put in place its full Emergency Response Team at Mangalore.? Its specially trained humanitarian assistance team called 'Angels of Air India' has already reached Mangalore. A local Coordination Centre has also been set up at Mangalore Airport.? There are eight survivors reported so far and they are under proper care in hospitals, supported by Air India's Angels and doctors.? The family members of the passengers are being contacted and all support offered to them for their travel and other arrangements. The Air India Flight Safety and DGCA teams have reached Mangalore.? Dubai Airport Tel. Nos. 00971-4-2165828/29.? Bangalore Helpline No. 080 66785172 / 080 22273310.? Mumbai Helpline Tel. No. 022 2279 6161.? Mumbai Airport Tel. No. 022 2616 8310.? Chennai Helpline Tel.No. 044 2256 0266. Air India Express regrets to announce that a B737-800 aircraft operating as flight IX-812 from Dubai to Mangalore was involved in an accident on May 22, 2010. The accident occurred this morning, after the aircraft landed at Mangalore airport and overshot the runway. There were 160 passengers and six crew members on board. There are eight survivors reported so far and they are under proper care in hospitals, supported by Air India's specially trained humanitarian assistance team called 'Angels of Air India' and doctors.? Air India is according top priority to assisting the families of the passengers. The family members are being contacted and all support offered to them for their travel and other arrangements.? In addition to the scheduled flight an additional flight was also operated on the Mumbai-Mangalore sector carrying relatives of passengers of IX-812 and the special assistance team of Air India.? Air India has also put in place its full Emergency Response Team at Mangalore. Local Coordination Centres have also been set up at Mangalore Airport and city. The international agency for emergency response and rescue operations M/s Kenyon has already been contacted to extend their support at Mangalore.? Air India shall provide all assistance and cooperation to the regulatory authorities that will investigate the accident. 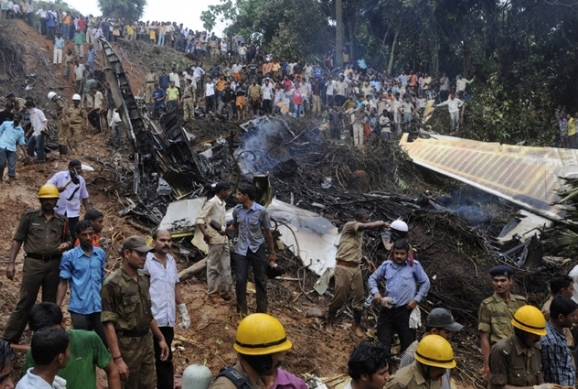 The Air India Flight Safety and DGCA teams have reached Mangalore for investigating into the accident.? To assist us in continuing to help those most affected by this accident, we request that relatives and close friends only contact our following telephone numbers :? Dubai Airport Tel. Nos. 00971-4-2165828 / 29.? Bangalore Helpline No. 080-66785172 / 080-22273310.? Mumbai Helpline Tel. No. 022-2279 6161? Mumbai Airport Tel. No. 022-2616 8310? Chennai Helpline Tel.No. 044-2256 0266? Kozhikode Helpline Tel. No. 0495-2771972? Air India Express B737-800 flight IX-812 from Dubai to Mangalore was involved in an accident on May 22, 2010. The accident occurred after the aircraft landed at Mangalore airport and overshot the runway. There were 160 passengers and six crew members on board. There are eight survivors and the remaining 158 bodies have been recovered from the site. Eighty seven bodies have already been handed over to relatives.? Air India is according top priority to assisting the families of the passengers. The family members are being contacted and all support offered to them for their travel and other arrangements. 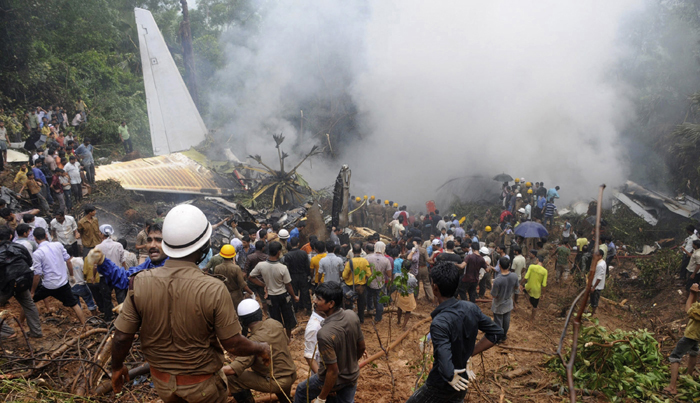 Additional flights were operated to take family members of the passengers and crew to Mangalore.? Air India has also put in place its full Emergency Response Team at Mangalore. Local Coordination Centres have also been set up at Mangalore airport and city. One SAT (Special Assistance Team) member, Angels of Air India, has been assigned to each survivor and to the families of the deceased to assist them in any possible way. The international agency for emergency response and rescue operations M/s Kenyon has already been contacted to extend their support at Mangalore.? Air India Express flight IX 812 of May 22, 2010 had a tragic accident in which 158 passengers and crew lost their lives. Regrettably, in certain sections, this accident is being used to malign the functioning of Air India Express and implying that the Operational and Engineering infrastructure is inadequate and does not meet the required norms. We wish to reiterate here that Air India Express meets all regulatory requirements and has been always well equipped to handle the operations and maintenance of its fleet to established standards. Apart from independent administrative and technical staff, Air India Express have fully trained and qualified Pilots / Engineers to run their operations. Additionally, Air India Express, being a part of the NACIL group, is fully supported by Air India in terms of infrastructure and services. Air India Express is an airline with an independent Air Operator Permit, owned and operated by a subsidiary of NACIL. The airlines operations are therefore independently audited by Regulatory Agencies and the audits have been cleared regularly from inception to the satisfaction of the Regulatory Agencies. The track record of Air India Express has been outstanding with its technical dispatch reliability being above 99.5%. The manufacturers of the fleet ? Boeing have also been very appreciative of Air India Express on this aspect. Air India Express has always been a world class international low cost carrier ever since its inception. Air India team in Mangalore to assist Interim claim. 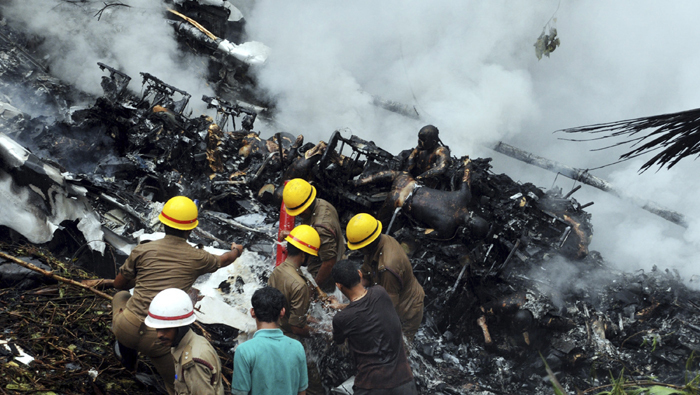 Air India will be positioning a team of officials including lawyers to Mangalore, who will be assisting the survivors and the relatives of the victims of the Air India Express flight IX 812 of 22nd May 2010, which met with an accident in Mangalore, in their claim for compensation. Mr. Sunil Kishen, Executive Director (Southern Region) will be coordinating the activities. The team will be in Mangalore, initially, for two days from 28th May 2010. Air India has already published an advertisement, in all leading dailies, giving details of the offices to be contacted, application download and submission etc, for the interim claim.? The Angels of Air India, drawn from different sections of Air India employees are in Mangalore since the crash, assisting the survivors, relatives of the victims in all their requirements. Air India has also arranged counseling sessions by for (sic) the survivors and the relatives to get over the trauma.? Air India would like to take this opportunity to thank all the employees, unions and associations who have extended unstinted support in all its activities during this hour of crisis. "There was no distress indication from the pilot. That means between the pilot and the airport communication there was no indication of any problem. The aircraft was in good shape and there was no problem with it. There was no operational deficiency at Mangalore airport." V.P. Agarwal, director of Airports Authority of India told local television. "I heard a loud bang early in the morning. Initially I couldn't understand what happened, but then I saw smoke coming out from the valley near the airport. Along with a few other neighbours, I rushed to the spot. It was rather difficult to reach the site because of the dense vegetation. We began pulling bodies from the wreckage and one of us informed the local authorities. I have never seen anything like this before. I am shocked." said Mohammad Haris, 42, who lives near Mangalore Airport. "I was deeply shocked to learn of the tragic crash of an Air India Express aircraft this morning in Karnataka, resulting in the loss of many precious lives. On behalf of the government and people of Pakistan and on my own behalf, I would like to convey our deepest condolences and sympathies to the bereaved families." Pakistan prime minister Yousuf Raza Gilani. Though it had been raining for 2 days, there was 6km visibility with no wind when the aircraft attempted to land. Air India's total loss stands at USD 750 million. Air India?can hull entire insurance worth USD 50 million. The entire insurance includes passenger and?third party liability. "The Air India fleet is insured by four private companies -- Reliance General, Bajaj Allianz, HDFC Ergo and Iffco Tokio. Reliance General is the lead insurer," said head of underwriting at Bajaj Allianz General Insurance Company, T.A. Ramalingam. It is understood that Reliance General had transferred the majority of the risk to re-insurers. The last major crash in India was on the 17th July 2000, when an Alliance Air Boeing 737-200 crashed into a residential area during a second landing attempt in the eastern city of Patna, killing 60 people. It is the worst accident since 1996, when a mid-air collision between two passenger planes near Delhi left 349 people dead, and the third worst in India's history (the 1978 crash of?Air India Flight 855?which killed 213 was also worse). This is the eleventh major air accident involving Indian carriers or in the India's air space since 1962. This accident is the eighth hull loss of a?Boeing 737-800?aircraft, and the worst crash (in terms of deaths) of all series of 737 aircraft.